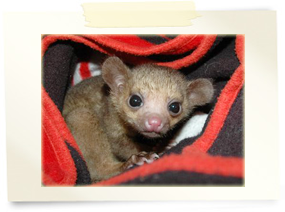 Otto and Obi, two of our resident kinkajous, are truly something special! 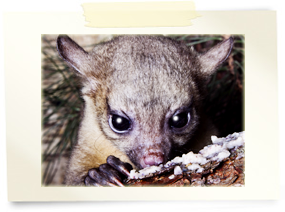 In case you’ve never heard of a kinkajou before – they are fascinating, secretive rainforest mammals that are sometimes referred to as ‘honey bears’. You could describe their appearance as a mix between a monkey, a bush baby and a teddy bear! In the wild they can be found across Central and South America, hiding in the trees of the tropical rainforests there. They have an amazingly long tongue for scooping the pulp from fruit, and an incredibly strong and multifunctional tail that acts as an extra hand – Otto loves to curl his tail around things and hang upside down! In our opinion, what makes these guys really special is their gentle and docile nature. These little guys wouldn’t hurt a fly, and don’t have a mean bone in their bodies! In fact, one of Obi’s favourite things to do is to put his arms around your neck and give your face a big snuggly cuddle! This is why the guests at our encounters fall hopelessly in love with these boys – it’s impossible not to be captivated by such loving and affectionate creatures! Otto and Obi don’t even play roughly – they’d much rather sit on your shoulder and ‘hug’ your neck with their tails than wrestle with you. If you’re lucky, Otto might even poke his tongue up your nose! Don’t worry, he’s always gentle and sweet! In fact, pretty much everything about kinkajous can be described as ‘sweet!’ Even the unusual noise they make is delightful to hear – perhaps you wouldn’t think it to look at them, but they actually make a cute little chirruping noise that sounds a lot like a bird tweeting! They also give off a sweet and distinctive scent from the glands on the mouth, throat and belly – it’s a very fruity smell that is actually quite pleasant! 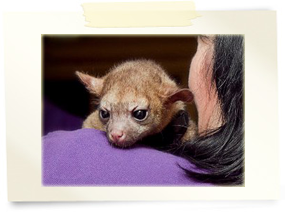 At home, Otto and Obi spend much of their time cuddled up to our other kinkajous, Narla and Khaya. They have been firm friends from the first moment they met, and love to get up to all kinds of mischief together! The boys love attention though, and enjoy all the fuss they get at our encounters. They can’t wait to meet you!